WHAT'S UP THE PIKE: Marc Fisher predicts future where Konterra gets built; Cedar Street bike lane named "World's Stupidest"; A Parent In Silver Spring appears in the Express. ABOVE: Apartment complexes throughout the region, particularly in Silver Spring, are targeting University of Maryland students kicked out of on-campus housing. 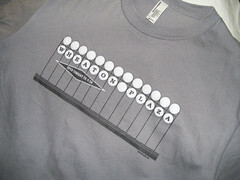 BELOW: An ad for The Enclave in White Oak, frequently spoofed on Silver Spring, Singular. As the spring semester ends here in College Park, the yearly hunt for student housing resumes once again. The University of Maryland has thrown a sizable portion of the junior and senior classes off-campus, and the pages of the Diamondback, our daily student newspaper, are choked with ads for nearby apartment complexes. 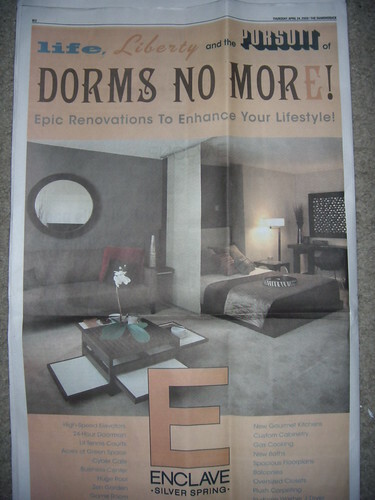 What's notable about this year's ads, however, is just how far away landlords think that students are willing to move. Of the twenty-six apartment complexes advertised in the Diamondback last Thursday, fourteen of them are in Silver Spring or along the Route 29 corridor. These apartments often tout their proximity to the Silver Spring Metro when many, like Waterford Tower on Briggs Chaney Road, are in fact almost nine miles away. 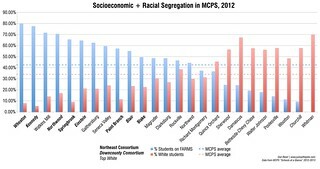 Seven are located in towns closer to College Park, like Hyattsville and Adelphi. 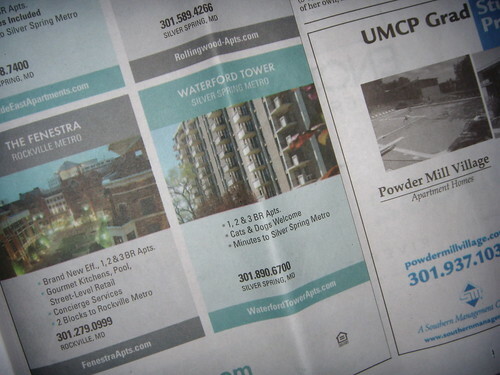 Just two of the apartment complexes advertised are actually in College Park. A less-than-flattering portrayal of College Park in the Washington City Paper two years ago just about sums up the general distaste many people have for the U of M's neighborhood, which may or may not be deserved. Meanwhile, student housing projects closer to campus have been stalled by either the school or the city. And so long as nothing gets built in College Park, it's very possible that the East County could see an influx of students in coming years. When I was residing just barely off-campus (still in College Park right across Route 1) attending full-time back in the mid-1980s, even then it was a fulltime madhouse 24/7. I would not even venture in the general direction of Route 1 on a weekend night, unless I was working my part-time job at Dominos. After a few semesters I had had enough. To this day, if people tell me they lived on-campus at UMCP and liked it, I tend to regard them with a certain degree of suspicion, in about the same way Clarice regards Hannibal Lector in the first part of "Silence of the Lambs". They might seem nice enough, definitely intelligent and well-educated, but you never know whether or not they've got a fancy to fry up your liver and devour it along with a presumptious little Chianti and some fava beans. Thanks for the link JUTP! My college-aged brother from California may take a class in College Park this summer and I think he has found a great apartment....my guest room.